Super Bowl XII on January 15, 1978 featured two 12-2 teams, the Dallas Cowboys and Denver Broncos, appearing in the first Super Bowl to be held in an indoor venue, the Louisiana Superdome in New Orleans. There was a crowd of 75,583 fans on hand in addition to a huge television audience. The Cowboys, coached by Tom Landry, were used to contending, having made it to the postseason for the 11th time in 12 years in 1977, and were just two years removed from their most recent of three Super Bowl appearances (a loss to the Steelers). 35-year-old QB Roger Staubach led the NFC in passing and All-Pro WR Drew Pearson led a solid group of receivers. Rookie HB Tony Dorsett didn’t move into the starting lineup until halfway through the season yet still rushed for 1007 yards and 12 TDs. The retooled defense was outstanding, particularly on the line that contained pass-rushing ends Harvey Martin, a consensus first-team All-Pro, and Ed “Too Tall” Jones and DT Randy White, successor to the great Bob Lilly and a Pro Bowl selectee in his first year starting. After handily topping the NFC East, the Cowboys defeated the Bears in the Divisional playoff round and Minnesota for the conference championship, outscoring their opponents by a combined 60-13. Denver, on the other hand, had never been to the playoffs previously. Under first-year Head Coach Red Miller, the Broncos benefited from the strong “Orange Crush” defense that featured DE Lyle Alzado, linebackers Randy Gradishar and Tom Jackson, CB Louis Wright, and SS Bill Thompson. The offense was conservative. QB Craig Morton, a 13th-year veteran who spent his first nine full seasons with Dallas, had joined the team in ’77 and provided steady guidance, if not statistical brilliance. The group of running backs was unspectacular while TE Riley Odoms led the club with 37 receptions and WR Haven Moses was the leading deep threat. After beating out the Raiders in the AFC West, the Broncos defeated Pittsburgh in their Divisional game and narrowly defeated Oakland for the AFC title. Dallas had the game’s first possession and punted, narrowly averting disaster on the first play from scrimmage when Tony Dorsett and WR Butch Johnson muffed an exchange on an attempted reverse, but Denver was unable to recover the loose ball. On their first series, the Broncos converted a third-and-12 play when Craig Morton completed a pass to Haven Moses for 21 yards to the Dallas 34. 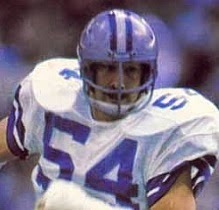 But following a short carry by HB Otis Armstrong, Morton’s next pass was batted down and he was then sacked for a loss of 11 yards by Randy White (pictured at right) to force a punt. The Cowboys, who were pinned back at their one after WR Tony Hill muffed Denver’s punt and fell on the ball, were no more proficient on offense and again had to punt, but three plays later a poorly-thrown pass by Morton, who was trying to avoid being sacked, was intercepted by safety Randy Hughes to give Dallas the ball at the Denver 25. Staubach threw a swing pass to TE Billy Joe Dupree for 13 yards and, following a two-yard carry by FB Robert Newhouse, Dorsett ran the ball three straight times, the last for a three-yard touchdown. Efren Herrera added the extra point and the Cowboys held a 7-0 lead. On the second play of Denver’s next possession, Morton threw another interception. The pass was tipped by LB Bob Breunig and CB Aaron Kyle grabbed the ball and returned 19 yards to the Broncos’ 35. A nine-yard run by Newhouse was followed by Dorsett picking up 18 yards around end. The series bogged down at that point and Lyle Alzado’s sack of Staubach on third down forced the Cowboys to settle for a 35-yard Herrera field goal. Dallas took a 10-0 lead into the second quarter. Denver again had to punt after a short series capped by DE “Too Tall” Jones tossing FB Lonnie Perrin for a seven-yard loss after catching a screen pass. Starting from their 43, the Cowboys advanced 32 yards in seven plays. Staubach threw to HB Preston Pearson on a screen pass for 11 yards and to DuPree for 19. Herrera kicked a 43-yard field goal to make it a 13-0 game. Dallas again got the ball back in short order when Morton’s underthrown pass intended for Moses was picked off by CB Benny Barnes. A penalty and a sack moved the Cowboys back and they punted, but WR John Schultz muffed the kick and LB Bruce Huther recovered for Dallas at the Denver 40. 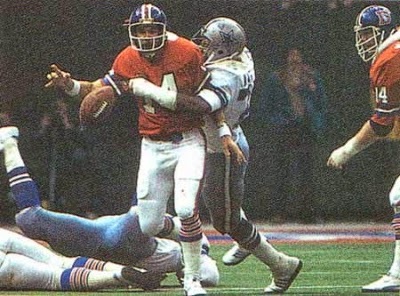 Dorsett gained 19 yards on a sweep, but the Broncos stiffened on defense and Staubach’s throw into the end zone was batted away by Louis Wright. The Cowboys came up empty when Herrera tried for a 43-yard field goal and was wide to the left. Once again the Broncos turned the ball over when Morton completed a pass to WR Jack Dolbin for 15 yards, but the receiver fumbled and Hughes recovered, returning it 19 yards to the Denver 27. Dorsett ran for eight yards and Newhouse for 10 to the nine yard line, but a swing pass to Newhouse lost seven yards at the two-minute warning and two more throws netted a gain of a yard. Herrera missed another try for a field goal, this time from 32 yards. The teams exchanged back-to-back turnovers on first-play fumbles by the tight ends and, with time running out in the first half, Morton threw another interception that CB Mark Washington returned 27 yards to the Denver 35. A short pass from Staubach to Preston Pearson set up a 44-yard field goal attempt by Herrera, but it was wide to the left and the score remained unchanged heading into halftime. Dallas failed to generate further points on turnovers by the Broncos while controlling the ball nearly twice as long in the first thirty minutes. The Broncos had the ball first in the third quarter and, while Armstrong gained 18 yards on a sweep, the drive stalled at the Denver 41. A fake punt failed when Bucky Dilts was sacked for a four-yard loss, but the Cowboys were penalized for having twelve players on the field to nevertheless keep the series alive. After reaching the Dallas 30, Jim Turner kicked a 47-yard field goal and the Dallas lead was narrowed to 13-3. The teams exchanged punts before the Cowboys advanced 58 yards in five plays. 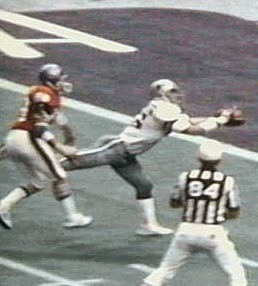 Staubach completed a pass to Drew Pearson for 13 yards on a second-and-ten play and, following a run for no gain and an incomplete pass, Staubach threw long for Butch Johnson, who made a diving catch for a 45-yard touchdown (pictured below). Herrera added the point after and Dallas was up by 20-3. The Broncos got a break when WR Rick Upchurch returned the ensuing kickoff 67 yards to the Dallas 26. Morton nearly threw another interception on first down and backup QB Norris Weese, who was more mobile, came into the game. HB Rob Lytle ran for four yards, Weese threw to FB Jim Jensen for five, and on fourth-and-one, Jensen ran for 16 yards. Lytle ran for the last yard and a TD and Turner converted to again make it a ten-point contest. The Cowboys finished out the period with a time-consuming drive. Staubach completed all five of his passes, the longest to DuPree for 18 yards, but on the second play of the fourth quarter he fumbled when sacked by LB Tom Jackson and NT Rubin Carter recovered at the Denver 45. A facemask penalty on the Cowboys negated a loss and gave the Broncos another first down, Weese threw to Upchurch for nine yards, and Armstrong ran for three to reach the Dallas 46. But that was as far as Denver could get. Weese’s next three passes were incomplete and the Broncos punted. Staubach was sidelined with a broken finger on his throwing hand and Danny White came in at quarterback for Dallas. The backup completed a pass and gained 13 yards on a draw play. While Staubach returned before the series was over, the Cowboys had to punt. Three plays later, a sack by Harvey Martin (pictured at top) forced Weese to fumble and Kyle recovered at the Denver 29. On the next play, Newhouse threw an option pass that WR Golden Richards caught in the end zone for a 29-yard touchdown. Herrera added the point after and, with seven minutes to play, the Cowboys had an insurmountable 17-point lead. Denver had the ball once more and reached the Dallas 24 before Weese’s incomplete pass on a fourth-and-23 play effectively ended the season for the Broncos. Dallas won by a final score of 27-10. The Cowboys easily outgained Denver (325 yards to 156) and had more first downs (17 to 11). The Broncos managed just 35 net passing yards and turned the ball over eight times, four apiece by interceptions and fumbles. While the Cowboys stifled Denver on defense, the offense wasn’t as dominating, fumbling six times but losing just two of them, their only turnovers of the game. Dallas also missed three field goals and set a Super Bowl record by being penalized 12 times (tied by Carolina in Super Bowl XXXVIII), to eight flags thrown on the Broncos. Roger Staubach completed 17 of 25 passes for 183 yards and a touchdown while giving up no interceptions. 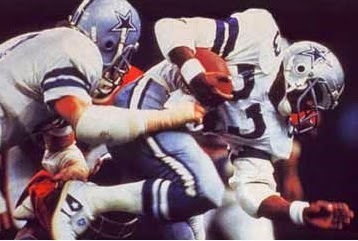 Tony Dorsett (pictured below), who left the game in the third quarter with a twisted knee, ran for 66 yards on 15 carries that included a TD and Robert Newhouse added 55 yards on 14 attempts in addition to throwing a 29-yard touchdown pass. Preston Pearson had five catches for 37 yards while Billy Joe DuPree gained 66 yards on his four pass receptions. On defense, Harvey Martin was unofficially credited with two sacks and shared MVP honors with Randy White, who had one in addition to helping to apply tremendous pressure on the Broncos. For the Broncos, Craig Morton was successful on just four of 15 throws, giving up four interceptions, and Norris Weese was four-of-10 for 22 yards but was not picked off. Weese also ran for 26 yards on three carries. Rob Lytle led the club with 35 yards on 10 rushing attempts that included the only Denver touchdown. Jack Dolbin and Riley Odoms caught two passes apiece, for 24 and 9 yards, respectively. Haven Moses gained 21 yards on his only reception, which came early in the contest. The Cowboys returned to the Super Bowl in 1978, losing a close contest to the Pittsburgh Steelers. They would not win another until the 1992 season. Denver again topped the AFC West in ’78 but lost in the Divisional playoff round. The Broncos next appeared in the Super Bowl following the 1986 season.